Manufacturer of a wide range of products which include edible gold leaf sheet and 24 karat gold leaf sheet. 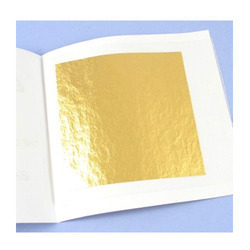 This Edible Gold Leaf Sheet is available in different thickness and sizes as per the demands of the customers. Our 24 Karat Gold Leaf Sheet is matched with the international quality standard and is reckoned for its pure quality. Our range is processed using pure quality ingredient, sourced from the authentic vendors of the industry.